I kind of figured I would have to post this sooner or later since I've gotten a phone call and more than one email on it lately but I never expected WND to post this folderol. But then, they do believe in a seven year tribulation, and that is par for the course for the disobedient among us. But the man in this WND article is now seen as a confirmed false prophet. And yes he is the one I exposed some time ago in my video about the blood red moons. If you look a little deeper into the man's strange claims for September 23, he and many others like him that are Sunday keepers and therefore incapable of understanding prophecy, claim the great tribulation is about to happen and they also declare it will last seven years of which 1260 days of it will be very intense and bloody for those "left behind" further twisting Bible prophecy out of whack to hedge up the Jesuit falsehood that was designed to hide the truth about the Vatican killing Christians during the real great tribulation from 538AD to 1798AD. In other words, the 1260 days that the prophet Daniel spoke of has already occurred. Not only do we have biblical proof, we have historic proof that it happened during the exact years the prophet Daniel declared it would happen via the testimony of the angel Gabriel. The 1260 days started in the exact year the church of Rome gained political power making her a woman on a beast as John the Revelator saw her, and for the next 1260 YEARS (for in prophecy a day = a year. See Numbers 14:34 & Ezekiel 4:6) the church of Rome initiated the "great tribulation" that the Jesuits of Rome have been trying to hide for centuries that proved the Popes of Rome were in fact the man of sin and prophesied as Antichrist! As also prophesied, many false prophets have come forward to gather sheep into the fire with them. This Mark Biltz and many others like him are simply obedient servants of the dying god of this world. PRAY he and others like him repent and become one with Jesus as the time to do is running out rapidly. The fact there are so many false prophets walking around confirms we are in the very last days! As for the signs that shall be from Heaven that these wolves declare in unison? No, Jesus was not talking about blood red moons, eclipses or the signs of the zodiac no less. Which by the way were invented by Pharaoh's Pagan magicians to help claim Pharaoh as a living god by stating the stars in the Heavens move about to glorify him via his birth date. (Yes, you're correct, that’s when horoscopes were invented) All those celestial events can be charted and mapped in time easily today which means we can know the exact time they will come to fruition. You can actually download a free app that will give you the exact time these things will happen. And so to believe those signs are of God is to actually call your God a liar when His Son plainly said in Matthew 24:36, "But of that day and hour knoweth no man, no, not the angels of heaven, but my Father only." All the prophecies that have been confirmed as fulfilled in historic record that the prophet Daniel spoke of during his 2300 year prophecy were in fact dated events! The angel Gabriel gave him an exact date (457BC) to start the prophetic timeline for that 2300 years and so to pull that 1260 years out from that timeline to place it in another timeline that started after the 2300 years ended is ludicrous and downright satanic to boot. It shows a deceptive reason for it all. And so for this false preacher Mark Biltz or men like him all over YouTube that make these claims using the horoscopes Satan himself invented as a "sign from God" are showing themselves to be the wolves prophecy spoke of. 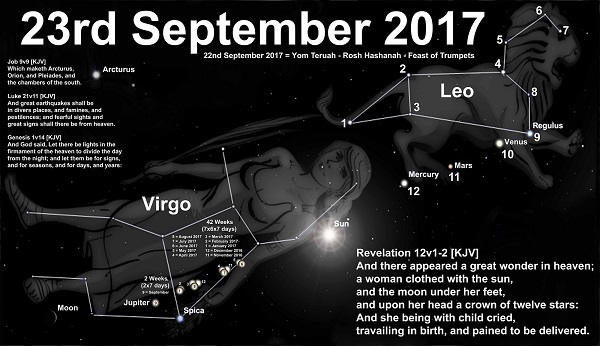 I mean common biblical sense dictates that why would the Lord need to use Satan's easily mapped and Pagan horoscopes as "signs in the Heavens" for the Christian church when our God created it all and can just as easily move a star to shine extra bright over Bethlehem as he did when Jesus was born? And so, that all being said, would you like to see a "sign in the Heavens" that is more in the lines of biblical jurisprudence that no man can map and no one can download an app to calculate? Check out the cloud that is right now moving out of the Orion Nebula. Let's see these wolves calculate that one! Now do you see why the Pope who has been caught worshiping Satan has a telescope named "Lucifer" pointing towards that Nebula? Even Satan doesn't known when it will happen and so he keeps his eye on that region of space FOR A REASON! Please study your Bibles and pray every day my brothers and sisters. It's very easy to expose these ravenous wolves! There is precious little time left and the Lord needs workers with spiritual backbones without guile to tell the truth as it is written. Christ is risen and Christ will come again! All the false prophets that echo Jesuit lies about a secret rapture, seven year tribulation or even 1000 years of peace are simply setting everyone up to accept Antichrist when he stands on earth claiming to be Jesus Christ. Most will believe it to be Jesus because most don't open their Bibles to see yet another prophecy that says Jesus never touches the earth at His second coming. In fact His obedient bride are caught up to meet Him in the air! (See 1 Thessalonians 4:16-18) These wolves preach a ton of false prophecies like this for a sinister reason. They do it to get the people weary of all their prophecies failing so that when the real preachers speak of the actual prophetic truths and warnings, most will think it’s just another false prophet crying wolf and they will be moved by Satan to ignore REAL prophetic events so as to ready them to stand in the flames of hellfire with Satan on that final day!